Continuing in the footsteps of the pioneering first edition, Signal and Image Processing for Remote Sensing, Second Edition explores the most up-to-date signal and image processing methods for dealing with remote sensing problems. Although most data from satellites are in image form, signal processing can contribute significantly in extracting information from remotely sensed waveforms or time series data. This book combines both, providing a unique balance between the role of signal processing and image processing. Featuring contributions from worldwide experts, this book continues to emphasize mathematical approaches. Not limited to satellite data, it also considers signals and images from hydroacoustic, seismic, microwave, and other sensors. 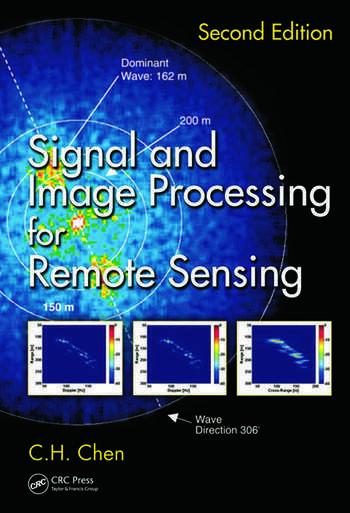 Chapters cover important topics in signal and image processing and discuss techniques for dealing with remote sensing problems. Each chapter offers an introduction to the topic before delving into research results, making the book accessible to a broad audience. This second edition reflects the considerable advances that have occurred in the field, with 23 of 27 chapters being new or entirely rewritten. Coverage includes new mathematical developments such as compressive sensing, empirical mode decomposition, and sparse representation, as well as new component analysis methods such as non-negative matrix and tensor factorization. The book also presents new experimental results on SAR and hyperspectral image processing. The emphasis is on mathematical techniques that will far outlast the rapidly changing sensor, software, and hardware technologies. Written for industrial and academic researchers and graduate students alike, this book helps readers connect the "dots" in image and signal processing. The second edition is not intended to replace the first edition entirely and readers are encouraged to read both editions of the book for a more complete picture of signal and image processing in remote sensing. See Signal and Image Processing for Remote Sensing (CRC Press 2006). Chi Hau Chen is currently the Chancellor Professor Emeritus of electrical and computer engineering at the University of Massachusetts Dartmouth, where he has taught since 1968. Dr. Chen has published 29 books in his areas of research. He served as associate editor of the IEEE Transactions on Acoustics, Speech and Signal Processing for four years, associate editor of the IEEE Transactions on Geoscience and Remote Sensing for 15 years, and since 2008 has been a board member of Pattern Recognition. Dr. Chen is a Life Fellow of the IEEE, a Fellow of the International Association of Pattern Recognition (IAPR), and a member of Academia NDT International. For more information about Dr. Chen, visit his web page at the University of Massachusetts Dartmouth. ...this book will be useful to advance automated image processing and the integration of remote sensor data with ecosystem and atmospheric models. The unique idea of combining signal processing with image processing is a good one and is well timed with ongoing technological advancements. Overall, the breadth and depth of content make this book an excellent reference for researchers, including graduate students, engaged in advanced remote sensing data analysis, who will find that some chapters provide inspiration to their own research.